United is gearing up to open its second Polaris Lounge, located in the international terminal at San Francisco International Airport (SFO), on April 30. Located near Gate G92, the new Polaris Lounge covers a total of 28,000 sqft across two levels and has capacity for about 440 people seated. Some 19 different types of seating are offered throughout the lounge, along with five private daybeds featuring Saks Fifth Avenue bedding for those looking to get some rest. 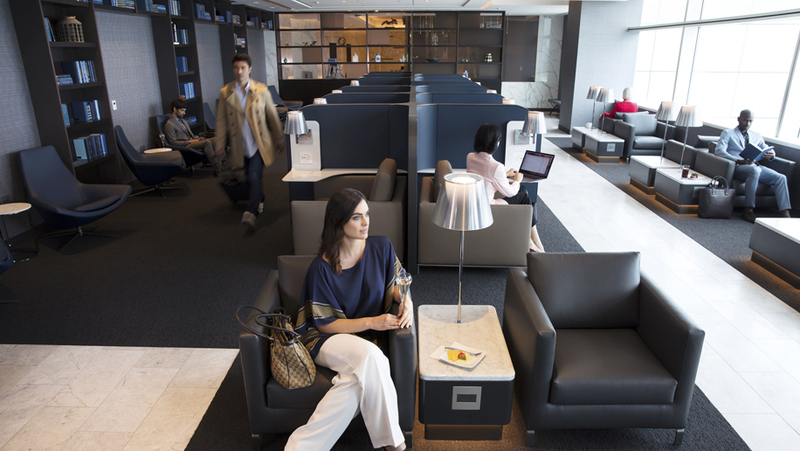 All seats have access to power outlets – the lounge has a total of 492 power and USB ports throughout the lounge. Guests can also clean up in the lounge’s eight rainfall shower suites, which come provided with Soho House & Co’s Cowshed Spa products, or make use of personal valet services such as garment steaming. From the F&B front, the lounge will have a restaurant style dining area named The Dining Room, which offers international fare ranging from traditional Chinese congee, hand-cut pappardelle pasta with mushroom ragout and the United Polaris Burger. There is also a bistro-style buffet – including a ramen noodle bar – that is available in the afternoon, while Bay Area-inspired cocktails such as the Mai Tai and Pisco Punch are also available. United currently has just one Polaris lounge in operation, located at Chicago O’Hare International Airport (ORD). Following the opening of the SFO lounge, the airline is also scheduled to open facilities at New York’s Newark Airport (EWR) in early June, Houston’s George Bush Intercontinental Airport (IAH) later this summer, and Los Angeles International Airport (LAX) in autumn. The new lounge forms part of the airline’s Polaris business class rollout, which it began in December 2016. However, despite significant hype for the new product, the airline has encountered numerous delays with the rollout. Currently, the Polaris seats are rolling out across four of the airline’s aircraft – the new B777-300ER, the B767-300ER, B777-200ER and the airline’s upcoming B787-10 Dreamliner. So far 14 of the airline’s 18 B777-300ERs have been retrofitted with the new seats, with the remainder due to be completed this year, and five of the 14 B767-300ERs have been retrofitted, with the rest similarly set to be finished in 2018. Meanwhile, none of the airline’s B777-200ERs so far have the new seats – retrofits are due to begin early this year – and delivery of the B787-10 Dreamliner is also expected to start in 2018. Speaking at a media dinner yesterday, Walter Dias, United’s managing director for Greater China and Korea, noted that while timeframe for the rollout was initially relatively quick for industry standards, the programme ran into some issues. “You’re still talking about 120 aircraft that you’re having to retrofit, so it does take a little bit of time,” said Dias. “Usually it would be a year or 18 months or so, but really we ran into some issues with the manufacturer not being able to keep up with the demand. Current expectations are that the carrier will be adding one aircraft with the new United Polaris business class seat every 10 days from now through 2020. However, these aircraft are now not just getting new business class products. Earlier this year, United confirmed it would be launching premium economy for the first time, named Premium Plus, which is set to be retrofitted to the airline’s fleet alongside Polaris. “The timeframe for premium economy will be the same as the Polaris retrofits,” added Dias. “The aircraft that are just going into the system now will start getting the premium economy hardware as part of the retrofit. Based on this timeframe, Dias notes the first aircraft to roll out with the new Premium Plus seats likely will be a mixture of the B767s and B777-200ERs. As for the B777-300ERs already operating with the Polaris seats, these likely will begin being upgraded with Premium Plus seats in the third year of the retrofit. Hong Kong was the first city to see the new Polaris business class product, which the airline rolled out in December 2016. Business Traveller flew on the first flight out of Hong Kong with the new Polaris-equipped B777-300ER (read the review here). Hong Kong is also one of just two destinations in Asia to have a United Club Lounge – Tokyo’s Narita Airport also has one. These too are set for an upgrade. Dias also hinted at the possibility of the Hong Kong lounge getting a separate Polaris space within the existing lounge that would be available just for passengers flying the airline’s Polaris product. San Francisco is a key hub for United, particularly in connecting the US with the Asia-Pacific region. Many of the airline’s Polaris-equipped Boeing 777-300ER aircraft operating out of SFO are currently deployed on Asia-Pacific routes, including to Hong Kong, Tokyo (Narita), Taipei, Beijing and Auckland. The aircraft also flies between San Francisco and Frankfurt, as well as between New York (Newark) and Tel Aviv and Tokyo (Narita).